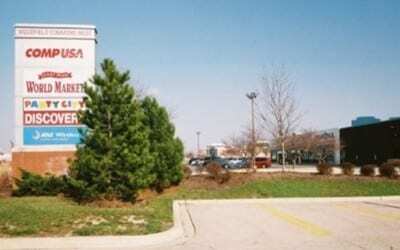 In July 1993, Klaff Realty, LP, in a joint venture with The CMS Companies, acquired this 197,000 square foot property center located just west of the Woodfield Mall on Golf Road. The property had three components: the 89,000 square foot Woodfield Commons East; the 61,000 square foot Woodfield Commons West; and a 47,000 square foot free-standing building leased to Toys R Us. A renovation of Woodfield Commons West was completed, which included the addition of Comp USA, Party City, and Cost Plus. The property was sold to Inland Real Estate in October 1998.